It’s that time again! Time for another edition of Landmarketing that’s packed full of interesting information and links. However, the summer issue is very unique. As you probably remember, we kicked off our “Discover Great Landmarks” photo contest. I asked you to send us your photos of Landmark Creations’ inflatables in action. I’m pleased to say that lots and lots of entries came in and I thank you for your participation. The entire Landmark team helped to choose the top eight entries. I contacted those companies and got some great feedback on how they are using their Landmark inflatables with some fantastic results! I’m going to share that information with you now. I know you’ll find it as interesting as I did. Of course, I’ll also announce the winners, too! Onto more exciting news- Back by popular demand… InflataBucks! That’s right - once again you can earn $100 cash each time you refer an associate to Landmark Creations. You send a referral to Landmark, we send your referral a $100 off coupon, they buy an inflatable from Landmark, we send you $100 cold, hard cash! Refer as many people as you like… there’s no limit to the number of $100 rewards you can earn. Hurry… ends November 1, 2003! More great inflatables “stuff” is in the works for the fall issue, so keep an eye on your inbox. But for now… on with the show! It was a tough job, but somebody had to do it! How exciting to see all the Landmark Creations’ inflatables in action. And even more exciting to read the stories of how they were put to use. Gaining free publicity, mentions in national magazines, and drawing enormous crowds are just a few of the successes that came from the use of Landmark Creations’ inflatables. Here are the top eight entries and their experiences (in no particular order). Now, the moment you’ve all been waiting for. Here are the names of the grand prize winner and the 2nd and 3rd place winners in the Landmark Creations’ “Discover Great Landmarks” photo contest. Our grand prizewinner is… Eric at the Minnesota Twins (Land O’ Lakes milk bottle)! Eric has won a down right spiffy Coleman cooler with built-in stereo/CD. He also gets a $75 discount on his next inflatable order! Good job, Eric! Our second place winner is… Erin at Fandango (Statue of Liberty head). Erin gets a $75 gift certificate good toward the purchase of her next Landmark inflatable. And our third place winner is… Pedro at Autopistas (World’s Best 10K arch). Pedro also gets a $75 gift certificate toward the purchase of an inflatable from Landmark Creations. As the temperatures begin to cool, Landmark Creations is heating up for fall! Sealed inflatables are generating a lot of heat these days, our Holiday Shapes Special offers hot deals, and our new Halloween Flash Game offers some fun in time for Halloween! You'll get details on all three in this issue of Landmarketing. The entrance of fall means the holidays are right around the corner, I know you'll be gearing up for a heavy promotional season. This means pulling out all the stops to get those coveted Christmas sales! That's why I've spent some extra time to find a few incredible marketing links that you'll want to check out. You'll also want to be sure your inflatable is in top shape. So in this issue, I'll begin a new series of articles on the electrical and hardware aspects of your inflatable ­ you know all the "watts and bolts!" On a special note: Everyone at Landmark Creations understands that this holiday sales season is vitally important to many of our customers. Please if there is anything we can do to help you end this year with more sales and higher profits, don't hesitate to ask! Phone us toll free at (800) 553-3593. That's all the fun for this issue. Look for Landmarketing to return this winter with more tips, tricks, resources and ideas. Oh! I almost forgot! Did you know there is another Landmark Creations? Who would have thought? Well they have shown up just in time for the holidays, and I encourage you to visit them online at Landmark-Creations.com - They make delightful hand-blown ornaments that are perfect for corporate or client holiday gifts. Tell them Steph from the "other" Landmark sent ya! Over the past several months Landmark Creations has undergone several major changes, implemented many new improvements and we're ready to tackle 2002 with a renewed sense of pride and devotion to our clients. We still carry our complete line of inflatables including cold-air inflatables, helium inflatables, sealed inflatables and inflatable costumes which, in and of themselves, are valuable promotional tools. However, we are now offering two new tools that can help you produce more from your marketing efforts than ever before! The first is this new and improved online ezine. This FREE electronic publication will quickly become a valuable resource for links to sites in the inflatable industry, tips on cleaning and maintaining inflatables, creative ideas for using inflatables, and information on where to find installers in your area. Second, is our new Customer Loyalty Program. Between now and March 31, 2002, you'll receive $100 CASH for each client you refer to Landmark Creations who purchases an inflatable. There is NO LIMIT to how many $100 referral bonuses you can earn between now and March 31st. But it gets even better. When you visit our special promotions page, complete the certificate and email (or postal mail) it to your associate, THEY will also receive $100 toward a new inflatable. It's just our way of putting our money where our mouth is when it comes to appreciation of your business. While you're filling out the form, be sure to visit the rest of our newly renovated site. We'd love to hear your thoughts and comments on the changes! We're looking forward to an exciting year. Please let us know how we can be of assistance to you with your marketing and branding efforts. Spring has sprung and that always makes everyone at Landmark Creations happy! Warmer weather naturally draws people outdoors and that means it’s the perfect time for outdoor inflatable advertising. To get you in the mood, we’re featuring several articles in this issue of Landmarketing to help you be prepared for the flood of new customers you’ll receive when you promote with inflatables. Look for a handy chart that will help you select the best inflatable for your particular needs. You can also find helpful care and maintenance tips for your helium-filled inflatables. There’s tons ‘o fun to be had, too! We have a great Easter game for you, direct from Dino our mascot, and (drum roll, please) a new photo contest where you can win big prizes just for sending in your pictures and inflatables success stories. We want to feature you on our site! Have you had great success using your Landmark Creations inflatables? Have you exceeded your marketing or sales goals during a promotion? Have you come up with a creative new way to use inflatables? We want to know about it. The Landmark Creations' staff has been full of excitement over the past few months. Several things have contributed to the merriment including the success of our kayak giveaway (I'll give you details in just a moment), the creation of our new brochures due out in August, and the revival of our ever-popular Inflatabucks program. Inflatabucks is Landmark's customer appreciation program that gives you an opportunity to earn exceptional referral bonuses. From now until October 1, 2002, we are once again giving you $100 for each client you refer to Landmark Creations who purchases an inflatable. There is NO LIMIT to how many $100 referral bonuses you can earn between now and October 1st. Plus when you visit http://www.landmarkcreations.com/promotions.html, complete the certificate and email (or postal mail) it to your associates and friends, THEY will also receive $100 toward the purchase of a new inflatable. Inflatabucks is a quick way to make some cool cash just for sharing Landmark Creations with others. And now (drum roll, please). The winners of our Summer Adventure contest! 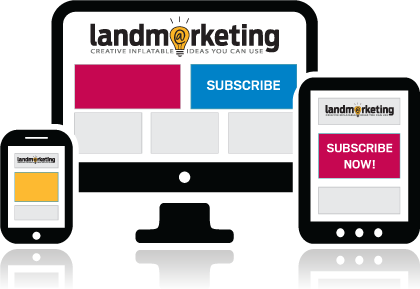 Each person referred at least one friend to the LandMarketing Newsletter. Doing so qualified them (and the new subscriber) to have their names entered into weekly prize drawings to win one of 12 inflatable kayaks. Congratulations to all! In this issue you'll discover a unique and highly effective "mobile" marketing method that has brought tremendous success to companies like Wilson and Louisville (i.e., Slugger). It can do the same for you! You'll also find the details of a new inflatables association who is working to bring about positive political changes. Of course, there is lots of other information to help you get the most out of your marketing and branding efforts. While you're planning those outdoor summer promotions, remember to include inflatables from Landmark Creations. You'll be drawing crowds from miles around, enforcing your brand identity, and practically guaranteeing the success of your event. Welcome back to another edition of Landmarketing and welcome to 2003! All of us at Landmark Creations hope this will be a productive, profitable and peaceful year for you! In order to kick the New Year off right, (and because demand was so high!) we've decided to hold over the Inflatabuck$ promotion. Inflatabuck$ is Landmark's customer appreciation program that gives you an opportunity to earn exceptional referral bonuses. Until April 30, 2003 you can earn $100 (cash) for each client you refer to Landmark Creations who purchases an inflatable. Also, the new Landmark Creations brochures will be available in February. If you'd like to pre-order one for your company, simply contact us and we ll get one to you as soon as they arrive. Looking for Inflatable Installers - We'd Like To Shine Our Spotlight On YOU! Need an affordable attention getter for your next event? Try our inflatable Hexiarch! This inflatable archway (with a hexagon-shaped top) is just the ticket for any event that needs a spectacular entranceway. Hexiarch inflatables are great for drawing crowds at sporting events, festivals, races, tradeshow booths and more. View our online gallery of arches. As spring begins and the weather warms, more and more our thoughts turn to outdoor promotions. The perfect setting for inflatable advertising! In addition to cold-air, helium, and sealed inflatables; Landmark has added a new and dynamic line of balloons that offer an entirely new twist to your promotions. These exciting, dynamic inflatables are just the ticket to give your marketing efforts a boost and they're budget friendly, too! The excitement continues to build with the introduction of our Summer Adventure contest guaranteed to float your boat (literally). When you refer a friend to our site and subscribe to Landmarketing, your name will be entered into a weekly drawing to win one of twelve inflatable kayaks. You will also be automatically entered in our final drawing, July 1st, to win a $500 gift certificate from the world's foremost outfitter, Cabelas.com! Don't have your own subscription yet? No problem! If you sign up as a new subscriber, your name will be entered into the drawings as well. Your summer adventures will be endless with this easy-to-use, two-man kayak. Remember, we'll give away one kayak each week, so keep those referral subscriptions coming! It's going to be a great summer as we work together to promote your business with the highest level of success yet (and have a little fun, too)! It's Spring Cleaning Time, Should You Machine or Hand Wash your Inflatables? Annual maintenance is a must to keep your inflatable working properly and looking its best. For those balloons that are used frequently, more regular cleanings are recommended. Keeping your inflatable clean will not only increase its life by preventing mold, mildew and the general stink factor, but it will do wonders for its appearance as well. We've seen amazing transformations of older, dirty inflatables after professional cleaning, both by hand washing and commercial machines. The question is, when do you clean your inflatable by hand, and when do you have it washed in a commercial machine?